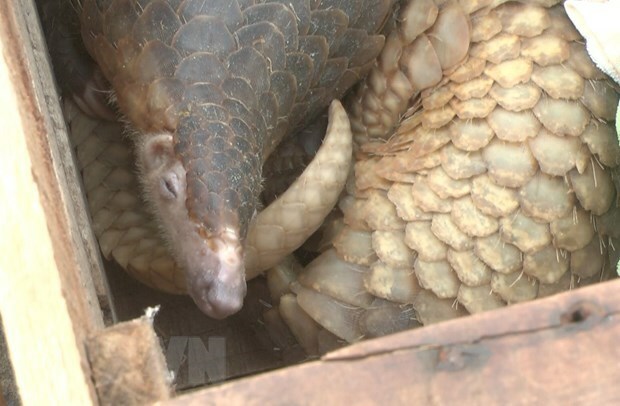 Hung Yen (VNA) – The Cuc Phuong National Park on April 17 received 39 pangolins rescued from wildlife traffickers and handed over by authorities of the northern province of Hung Yen. The Hung Yen police and the traffic police detected a van suspected of carrying smuggled and banned goods at the toll plaza of Hanoi-Hai Phong Expressway in Tan Tien commune, Van Giang district of Hung Yen. However, the driver sped away in an attempt to escape from the police. The van was then stopped in Duong Kinh ward of Hai Phong city, but the driver and all those aboard managed to flee. Examining the van, the police discovered 39 pangolins and many fake car number plates. The pangolins, weighing 136kgs in total, are Java Manis Janaia which is listed as endangered and rare species needing urgent protection.